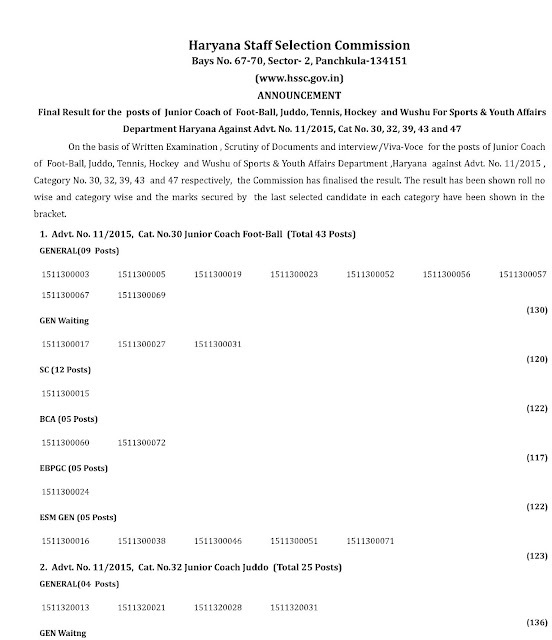 HSSC (Haryana Staff Selection Commission) has Declared Final Result, Merit List / Cut Off Marks for the posts of Junior Coach of Foot-Ball, Juddo, Tennis, Hockey and Wushu For Sports & Youth Affairs Department Haryana Against Advt. No. 11/2015, Cat No. 30, 32, 39, 43 and 47. On the basis of Written Examination , Scrutiny of Documents and interview/Viva-Voce for the posts of Junior Coach of Foot-Ball, Juddo, Tennis, Hockey and Wushu of Sports & Youth Affairs Department ,Haryana against Advt. No. 11/2015 , Category No. 30, 32, 39, 43 and 47 respectively.